Hi Ailsa, and welcome to my blog. Thanks for taking the time to answer my questions. You come from a long line of witches, have been a Wiccan High Priestess, practise Shamanism and are a healer. What exactly is Shamanism and what influence does that have on your writing? Ailsa: my past experiences in ALL forms of religion have led me to where I am now which is respect for the spirit of everything. I can happily chat to stones, injuries, creatures, plants etc. because I know they have a spirit and communing with them is a form of worship. My writing is based on what I know, from a Quaker aunt to a Presbyterian mother via a Jewish father and my own “alternative” religious practices. When I write “magic” it is the real deal, energy fields and forces. A shaman can “feel” a tree being felled or “understand” what an animal needs. I know I’m bats but I merrily natter away to my kitchen equipment and the stove works far better for me. Vanessa: I should clearly try that instead of giving recalcitrant devices a good kick and swearing at them! That was a movie trailer that flashed through my head while sitting out in the back garden. The first scenes of Shaman’s Drum were played out in my mind’s eye and I was hooked. I had to find the back-story and see where it went from there. At the time I was taking a break from another series under a different pen-name and this scene was so “other” that it grabbed me. 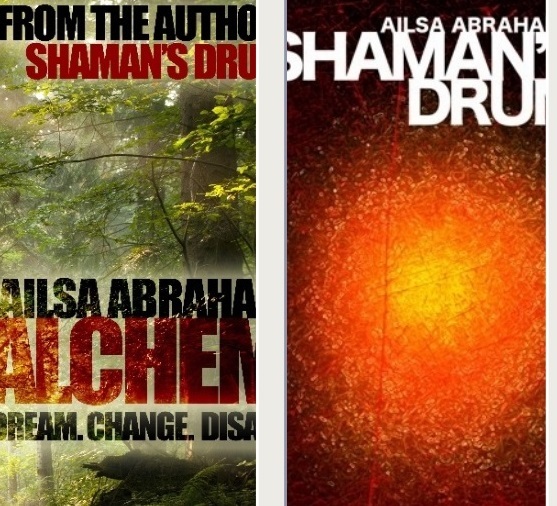 Alchemy is a prequel to Shaman’s Drum, written by popular request from your fans. It’s about an invention so monumental that it could spell the end of environmental disaster and conflict. What sort of research did you have to carry out to write it? Very little. Given that I’d already worked out that the old religions had come back into their own, I had to work very hard with my husband who is a scientist to get the ecological and chemical side of things correct. The scientist being a very moral person it struck me as quite logical that she would want to bargain for the “formula” but in a form that would heal the other ills of the world, not for money. Vanessa: yes, it was the scientific stuff I was referring to. Helpful to have a resident scientist on hand for these occasions. Which of your two main characters, Iamo and Riga, do you prefer and why? Very hard to say. Riga is based on a very much younger version of me complete with many of my faults. Iamo is an idealised man, possibly not my “dream guy” because he tends to let Riga take the lead too much but he is highly intelligent. I think the two together are my best friends. They must be, they live in my house! You say on your blog that your novels are “genre-defying”. What challenges does this present in promoting them? I’ve also been asked (arm-wrestled) by my French friends into agreeing to write my memoirs of the last 25 years over here IN FRENCH. They all said that any faults would be hilarious (reminiscent of ‘Allo ‘Allo) and so as a bit of therapy I will be doing that too. Vanessa: this all sounds great. And I’ll be first in the queue for your memoirs. What’s your favourite French dish? It would have to be a dessert as I’m vegetarian and French cuisine does not cater well for us. Even the innocent salads are sprinkled with bacon pieces! So I’m going to go for the home-made meringues from our local baker, Pierre who is mad, kisses my hand and chats to me in pseudo 17th century French. I’d team that with some ice cream and the jam that I make myself, failures-to-set are called “coulis” and poured over desserts! Et voilà – perfect for me! Vanessa: it’s not easy being a vegetarian in France. I’m not, but we have friends who are, and they are usually offered a ham omelette as the veggie option. Thank you so much for joining me today, Ailsa. We’ve not met in person, but I feel I know you! Ailsa Abraham retired early from a string of jobs, ending up with teaching English to adults. She has lived in France since 1990 and is married with no children but six grandchildren. She copes with Bipolar Condition, a twisted spine and increasing deafness with her usual wry humour – “well if I didn’t have all those, I’d have to work for a living, instead of writing, which is much more fun.” Her ambition in life is to keep breathing and maybe move back to the UK. She has no intention of stopping writing. Her other passions are running an orphanage for homeless teddy bears plus knitting or crochet. Stay tuned for next week’s Friday guest, Helen J. Rolfe, whose début novel The Friendship Tree is published on 24th February. Copyright © Ailsa Abraham, Vanessa Couchman 2015. All rights reserved. 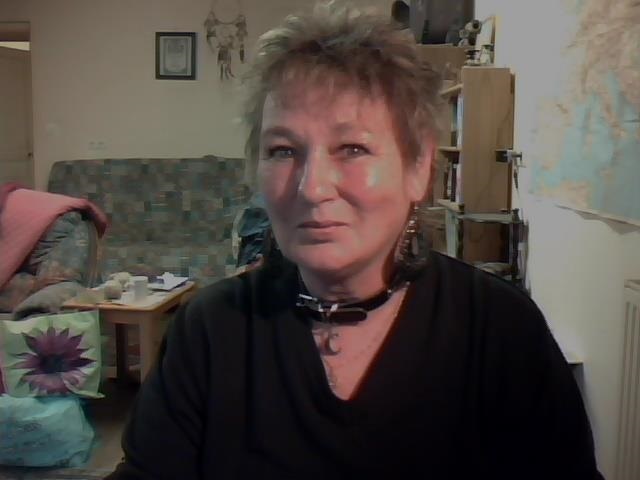 This entry was posted in Author interviews, Fiction and tagged Ailsa Abraham, author interview, Crooked Cat Publishing, ecological fiction, fantasy fiction, fiction, Novel, romantic fiction by nessafrance. Bookmark the permalink. Thank you, Sir S. Your turn soon! She makes a great interviewee. Our ever popular Ailsa Abraham is under the spotlight with Vanessa Couchman today.. as delightful as ever. thanks ladies..
Great fun and I look forward to coming to the Bingergread Cottage soon. Thank you, both, for that interesting interview. Sorry, but I doubt I’ll be reading the memoir… unless it’s translated into English. Dear Vanessa Couchman invited me over to chat today. It was great fun and she’s going to be coming here for a “return match”! Looking forward to it, Ailsa. Fascinating review, ladies, love how you got the inspiration for Shaman’s Drum and that mad baker of yours, he sounds wonderful, must come and visit the Bingerbread Cottage when next in France (and of course the lovely occupants within!). Our baker also makes lovely meringues, light as a cloud, but he’s not mad as far as I know. Glad you enjoyed it, Shani: Ailsa as delightful as ever.